Can PandaPow Classic provide you with enough encryption and privacy? PandaPow Classic is a VPN service that offers both hardware and software solutions. This PandaPow Classic review will take a look at the software solution. The company itself is based in Hong Kong. As far as the hardware options go PandaPow has the PandaPow WiFi option. If you want to read a review for that then click here. The PandaPow Wifi option is actually a VPN-enabled router. And it comes as a free add-on to the company’s VPN service. Throughout this PandaPow Classic review, you will come to realize that PandaPow Classic is a reasonably good VPN service provider. But it doesn’t have enough meat on its bones. Its customer support doesn’t have anything to talk about and that is putting it mildly. Moreover, our research for this PandaPow Classic review also shows that PandaPow Classic does not protect its users against DNS leaks. Which is a big problem in the modern web. You can start your VPN journey with PandaPow Classic with as little as $9 per month. If you sign up with the company for a period of twelve months then you only have to pay $7 per month. There is also a seven-day money-back guarantee that you can avail if you find that PandaPow Classic isn’t really what you expected from a top VPN service provider. There is also a PandaPow Classic and PandaPow Wifi (the VPN-enabled router solution) combo subscription package. You can sign up for that with just $149 per year. With that package, you’ll also get three months of free VPN service. All subscribers to PandaPow Classic can connect from one to three devices simultaneously per account. PandaPow Classic has apps and desktop clients for its VPN services. This is something a lot of VPN service providers don’t have. 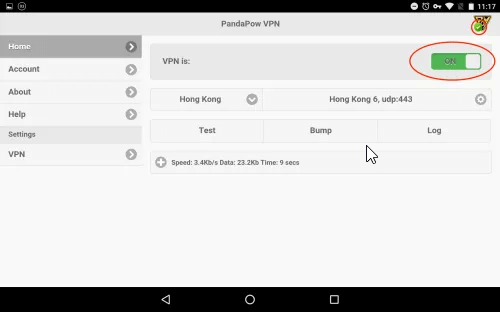 All of the PandaPow Classic apps and clients make use of the OpenVPN protocol. As we all know, the OpenVPN protocol is the best VPN protocol that is available in the market today. In fact, we think that OpenVPN protocol is the only protocol that beginners users should use. It is fast, though not the fastest, and the most secure of all the VPN protocols. All of these protocols are available to all the users who subscribe to PandaPow Classic VPN service packages. Devices that do not have the appropriate app support can also make use of these protocols except the OpenVPN protocol. There isn’t really much to talk about in the features section of this PandaPow Classic review. As mentioned before, PandaPow Classic is a pretty lean VPN service provider in terms of the features it offers. Moreover, it doesn’t have any advanced features. It doesn’t even have some of the standard features that we can find in most modern top VPN service providers. For example, all VPN service providers have now increased their number of simultaneously connected devices to either five or above 5. But PandaPow Classic offers only three. As you’ll go through the rest of this PandaPow Classic review, you’ll find that PandaPow Classic doesn’t do anything exceptional. 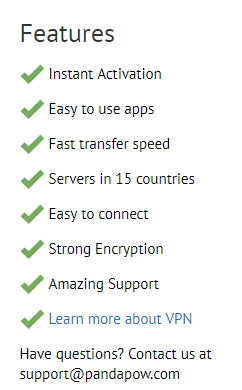 It isn’t really a bad VPN service provider. But in an age where even the top VPN service providers are providing a ton of features at prices below than those that PandaPow Classic if offering, it doesn’t really stand a chance of climbing up the ladder anytime soon. 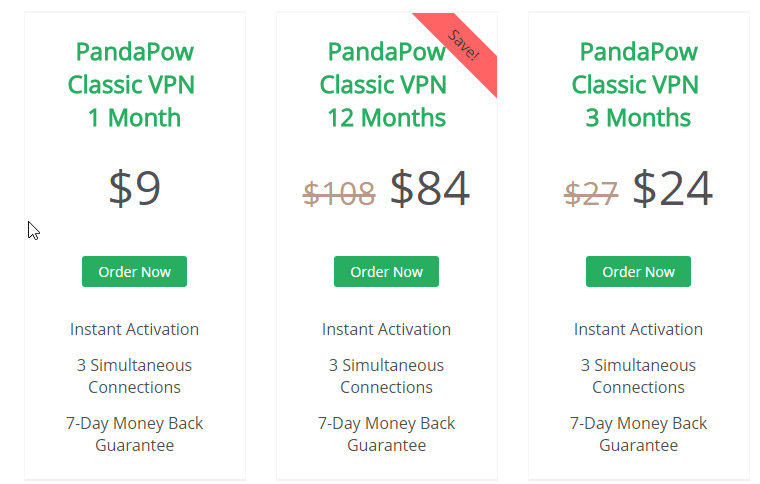 PandaPow Classic offers new users VPN servers that are located in over 14 countries. If you are a subscriber to the PandaPow Classic subscription package then you can use all of them. As indicated earlier as well, PandaPow Classic is a VPN service provider that is based in the city, or region, of Hong Kong. Hence, it doesn’t have to agree to any mandatory data retention laws. It gives new users a lot of useful information about the company and how it operates. More specifically, it says that the company, under no circumstances, stores private information about their customers or their activities. Moreover, they don’t keep a record of the activity on the company’s network either. They don’t monitor activities such as visited websites, chats, VOIP calls, and emails. PandaPow Classic does keep connection logs. Connection logs are basically metadata logs. Sometimes VPN service providers keep “metadata” logs in order to “improve” user experience. Of course, if a VPN service provider wants to make it to the top then it has to stop keeping any sorts of logs. But PandaPow Classic isn’t one of those VPN service providers. The company clearly mentions that the company does store any and all personal information that the user provides to them. The exact time the customers connected to the company’s network and service. Of course, all of this isn’t really good. Organizations such as the NSA along with CIA and their friends can’t touch you because the company is based in Hong Kong and these agencies don’t have jurisdiction here. then the company may have to initiate some measures in order to prevent the user from using the company’s network to carry out illegal actions. PandaPow also says that it wants to avoid legal actions that others may take as a result of its customers engaging in piracy. Filtering internet traffic to precisely determine which user account or user has misused the company’s services. The company can also cancel the user’s account if found guilty of downloading any copyrighted content. In other words, no, you can use P2P technologies with PandaPow Classic. Our research for this PandaPow Classic review tells us that the company’s representatives aren’t exactly truthful. They will tell you that the company used one of its proprietary protocol which is totally SSL based. And PandaPow Classic does use “that” protocol. The problem is, “that” proprietary protocol isn’t really proprietary. It is just your regular OpenVPN protocol. Moreover, the Windows client of PandaPow Classic is a customized edition of OpenVPN 2.3.11 client. And while that isn’t a crime (since OpenVPN is open source) it does take a lot of credit away from a paid VPN service provider. Paid VPN service providers are expected to develop their own products and not use the ones that are open source. There is nothing wrong with using open source technologies, but it is a bit unethical to use open source technologies and brand them with your own name. PandaPow Classic also says that the VPN protocol it uses is also proprietary. That, unfortunately, is not true. The company’s representatives also say that the developers working for the company have designed the VPN protocol specifically to enable users to block geo-restrictions and avoid detection. The company says that its own version of VPN protocol can withstand a lot of pressure. And that other VPN protocols break when they are put under similar pressure. Our research for this PandaPow Classic review tells us that the company isn’t telling the whole story. Its representatives said that the company could not divulge the details about its VPN protocol because hackers might use that against their systems. They also say that some parties want to block their VPN service. So they have to keep a bit of secrecy in how they operate and work. Moreover, they say, their VPN service has seen a lot of success in the last couple of years. And PandaPow Classic has consistently shown good results in areas where their “competitors” have struggled with blocks. Our research for this PandaPow Classic review tells us that the company uses OpenVPN connections. And then it routes them over TCP Port 443. We have also come to know that even this setup isn’t used everywhere. But only in places such as China. We’ll talk more about this later in this PandaPow Classic review. Blowfish 128-bit cipher with RSA 2048-bit handshake. It couples these up with HMAC SHA-1 hash authentication. Because these are the same settings that you found in OpenVPN settings. PandaPow Classic representatives will also tell you that their company offers perfect forward secrecy. In other words, PandaPow Classic implements perfect forward secrecy. But not in a way that enhances PandaPow Classic VPN service. Because the latest version of OpenVPN, OpenVPN 2.4.0, has also implemented perfect forward secrecy. And it isn’t a coincidence that both are offering the same feature. This further leads us to believe that PandaPow Classic is using the OpenVPN protocol on all its clients. The other problem is with PandaPow Windows VPN client. We know that it is based on a slightly older version of OpenVPN, OpenVPN 2.3.11. This means that the Windows client doesn’t have configuration files specified for Diffie-Hellman and/or ECDH keys. This further gives the indication that PandaPow Classic doesn’t use perfect forward secrecy. Of course, such as configuration is fine for most users. But we don’t think it is enough for users who want some serious protection for their privacy and anonymity. In other words, we don’t think that PandaPow Classic has a secure VPN connection. VPN service providers should provide connections which are resistant against any and all known cyber attacks that are present and those that may come in the future. The company’s representatives will tell you that they are working hard and are in the process of coming up with more options in order to strengthen their encryption technology. If they do come up with such an update, we think they will probably upgrade their encryption technology with AES 256 bit. The official PandaPow Classic website has little visual polish. Given that most of the elite VPN service providers have great looking official websites, this is certainly a negative point. Besides, people love glossy looking websites which feel snappy. Regardless, the official PandaPow Classic website is simple enough to use and navigate through. There is a dedicated FAQ section which tries to answer the most common questions. But we found that it did not cater to advanced users. Basically, it is for beginner VPN users. And that isn’t a bad thing per say but top VPN service providers have a bit of information for every kind of user. You can also read an official blog if you want to. The blog has updated articles on what is happening with the company and the latest developments in the industry. This is the area we have waited to review for a long time. You can contact the company with your queries and questions via live chat or ticketed email. Now, with that said, you will have to take care of different time zones. Make sure you use these features by giving proper thought to the time in Hong Kong. And then mix and match so that you can match their working hours at your convenience. In theory, PandaPow Classic indeed has live chat support. They have a lovely button placed on the official website as well. In reality, our research shows that the company has not invested appropriately in its live chat feature. And you will find that a lot of times you won’t connect to its live chat feature. PandaPow Classic also offers customer support via phone. Of course, you’ll have to make sure you contact them within Hong Kong working hours. Hong Kong time is GMT + 8 for those who are interested. Moreover, while calling, you must keep in mind that all calls will carry regular international charges. In other words, don’t call them unless you have a very serious and immediate issue. Our research for this PandaPow Classic shows that you should expect partial responses to your queries and questions. And don’t expect them straight away. Or even 24 hours from the time you make the complaint. Expect them to answer your questions in two to seven days. If you ask them details about the things that confuse you then they won’t clarify anything for you. Sometimes, PandaPow Classic customer support can take up to two weeks in order to respond to your query. So get ready to exercise your patience muscles. Let’s start with the installation process itself. All modern VPN service providers, whether they are good or not, have made it very easy for their potential customers to sign up for their VPN services. PandaPow Classic is no different. You’ll have a comfortable ride while installing PandaPow Classic on your machine. The company will automatically charge you recurring bills if you don’t cancel the subscription yourself. Moreover, you can pay via Bitcoins if you want some extra privacy. But you’ll have to pay them via Coinbase. This will definitely grant you more anonymity and privacy from the start to the finish. As we have described before, PandaPow Classic Windows Client is just a customized version of OpenVPN 2.3.11. OpenVPN has moved on from this version to OpenVPN 2.40.0. This version comes with a ton of improvements and new features. You can read about all of those by clicking here. The first message you’ll receive when you run PandaPow Classic Windows client is “are you located in China”? We don’t know what happens differently when you answer with “no” as opposed to a “yes”. PandaPow Classic probably activities the company’s “proprietary” encryption technology when the user answers with a YES. As mentioned before, the main screen of PandaPow Classic Windows Client is simple enough. It also has very little in the way of options or settings. The only options that we think are worth a mention are related to whether you want an OpenVPN connection over TCP or UDP. That doesn’t mean it doesn’t work. It does its job rather well. But you can’t have a Windows VPN client that is as lean as this one. Measuring the speed of any VPN service provider is a slightly difficult task. Well, the first thing you should know about VPN service providers is that, all of them reduce speed. The good ones don’t reduce speed as much as the average or the bad ones. VPN service providers work by encrypting your data and then re-routing it through one of their own VPN servers. This takes time because the data has to travel a lot. Moreover, it takes significant hardware resources as well. And hence VPN service providers reduce speed no matter where you use them. As mentioned before, you can separate a good VPN service provider from a bad VPN service provider by measuring how much speed a VPN service provider consumes or removes from your internet connection. You can go to speed tests sites like speedtest.net and speedof.me to test your speed. But you’ll have to perform several tests and then compare them to gauge the true speed of your VPN service provider. All you need to do is go to the above-mentioned websites and then test the speed of your internet connection without a VPN service. 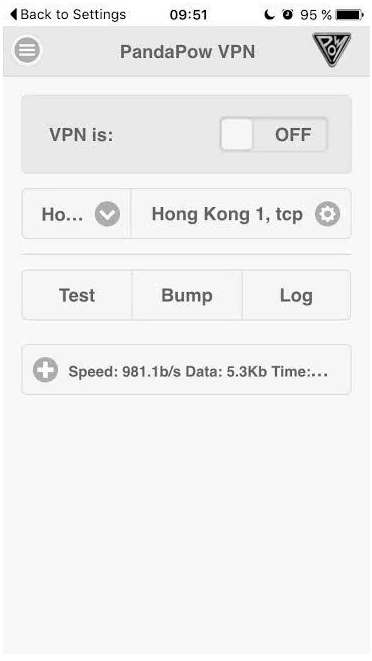 Then turn on your VPN service provider and measure the speed again. Perform this test at least three times with different servers. You should also vary the location of your VPN servers. Because VPN servers that are located near to your physical location will generally provide more speed. Therefore, to balance out the results you need to select a VPN server that is located as far away from your physical location as well. Moreover, the US VPN servers are usually faster than servers located in any other country. Therefore, to account for all these factors, we recommend that you should carry out the speed tests multiple times and then average out the results. Our research for this PandaPow Classic review tells us that PandaPow Classic is pretty fast when it comes to VPN servers that are located in the US and in the UK. But it isn’t quite up there with the best VPN service providers such as ExpressVPN or IPVanish. It’s performance statistics did not surprise us. And as expected, Netherlands (a non-US and non-UK country) had the worst speed performance of all VPN servers. Google DNS servers proxied most of the IPv4 DNS requests. Of course, this isn’t much of a problem for some users. Some users take this as a nightmare scenario. But what you should know is that it is PandaPow Classic that makes all the requests. So your IP isn’t actually exposed. As far as Netherlands DNS resolution goes, PandaPow Classic servers in the US perform that task. This is a risk since geo-spoofing can sometimes malfunction under such settings. Our research for this PandaPow Classic review tells us that PandaPow Classic does not protect its users from DNS leaks. No top VPN service provider comes with DNS leaks. In other words, all of them protect their users from DNS leaks. Since PandaPow Classic uses the OpenVPN protocol and OpenVPN protocol has now managed to come up with a fix for WebRTC IP leak, PandaPow Classic protects against WebRTC leaks. In other words, PandaPow Classic does not reveal a user’s outfacing IP address. And hence protects a user from any potential IP leaks. Does It Work With US Netflix? PandaPow Classic does not unblock US Netflix. Even if you connect to a US server, you can’t connect to the US Netflix. Since a lot of users only sign up for VPN services because they want to unblock US Netflix. However, there are plenty of other VPN service providers who do work with US Netflix. One of them is StrongVPN. PandaPow Classic does work with BBC iPlayer if that is your thing. If you want to make PandaPow Classic work with BBC iPlayer then all you have to do is connect to a VPN server that is located in the UK. Our research for this review tells us that all these apps basically use OpenVPN. And we can tell you from our experience that it is very rare of a VPN service provider to use the OpenVPN protocol for iOS apps. PandaPow Classic does provide instructions for new users to configure a handful of other mobile and classic devices as well. You can also use L2TP/IPSec and PPTP with those devices. 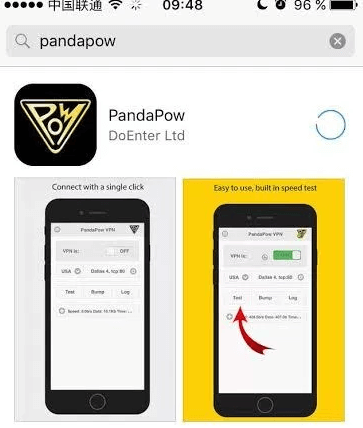 Check out the instructions page on the official website if you want to know more details about how you can set up PandaPow Classic on your device. However, it is likely that you have a device that falls within the four we have mentioned above. If that is the case, then you don’t have to read those instruction manuals because PandaPow Classic makes the whole process easy for the users. One strange thing that we discovered about PandaPow Android app is that it wants you to grant it access to your files/media/photos. Why does it want that access? Regardless, the Android app feels snappy and works rather well. You can download the PandaPow Classic Android app from Google Play Store. That is the safest and the fastest way to install an Android app on your smartphone. If you look at the official Google Play Store page for PandaPow Classic, you will see that some reviewers have complained that PandaPow Classic drains your smartphone’s battery like crazy. Some reviewers also said that it forms unstable VPN connections and hence is not really reliable. The Android app does protect users against WebRTC leaks and DNS leaks. That is great news for the company’s Android app. The company is based in the region of Hong Kong. The company does not use proprietary VPN protocols but says otherwise. It uses the OpenVPN encryption protocol. And the baseline version of it. Speed results did not excite us. PandaPow Classic is a budget VPN service provider. And it is decent in many aspects. The bad part is that PandaPow Classic charges you premium rates for its otherwise average VPN service. It has horrible customer support that can take up to two weeks to respond to your answers. Sometimes their representatives can lie to your face and sometimes they can just give you inaccurate information. This does not go well as far as the company’s PR problem is concerned. We’re also not sure if PandaPow Classic uses proprietary VPN protocol. And that means the company is trying to deceive users into buying its otherwise below average VPN product. We always recommend people to always use OpenVPN protocol because it is secure, fast and open source. And we should not trust a company’s unaudited and unknown alternative VPN protocol. PandaPow Classic is a VPN service that does very little to protect its reputation. It keeps on making mistakes which gives us the impression that the company is way more concerned with making money than providing users with a decent product in return for their money. Moreover, in the performance department, the company comes out with highly variable results. It also does not protect you against DNS leaks. You can check that out for yourself by visiting sites like ipleak.net and turning on PandaPow VPN service. These are the reason why we believe that PandaPow Classic is not even worth your time. If you want to really protect yourself then you’re better off with something like IPVanish. 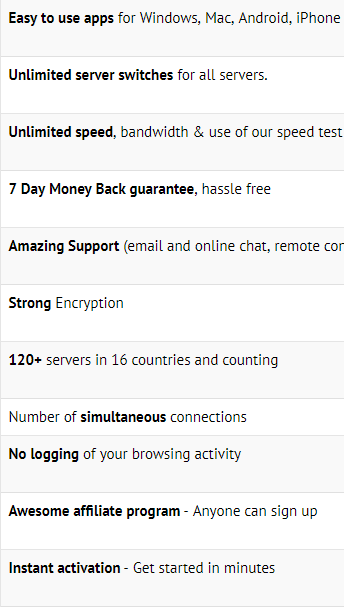 IPVanish is the top rated VPN service provider on our site and for good reason. To read the full IPVanish review click here.